Gilbert’s syndrome is a benign liver condition that is characterized by elevated levels of bilirubin in the blood. Bilirubin is produced by the breakdown of red blood cells and is able to be removed from the body after the liver converts it from unconjugated bilirubin to conjugated bilirubin. In individuals with Gilbert’s syndrome, there is a buildup of unconjugated bilirubin in the liver as a result of a genetic mutation of the enzyme UDP-glucuronosyltransferase 1A isoform 1 (UGT1A1), which is important in bilirubin metabolism. The buildup of bilirubin is particularly evident after starvation, exertion, infection, consumption of alcohol, or dehydration. Bilirubin levels fluctuate and rarely increase to levels that cause jaundice. Estimated to affect 3 to 7% of individuals of all races. More common among males (2:1) compared to females (7:1). Symptoms of Gilbert’s syndrome may include mild jaundice of the skin and eyes and is more commonly seen when the body is under stress . 30% of individuals will never have any signs or symptoms. In the study published by Radoi et al, 74% of the participants presented with recurrent asymptomatic jaundice, 66% nausea, 65% asthenia, 52% vague abdominal distention, and 8% were asymptomatic. There are no associated co-morbidities for individuals with Gilbert’s syndrome. Diagnosing Gilbert’s syndrome can be done by a blood test that detects elevated bilirubin levels. 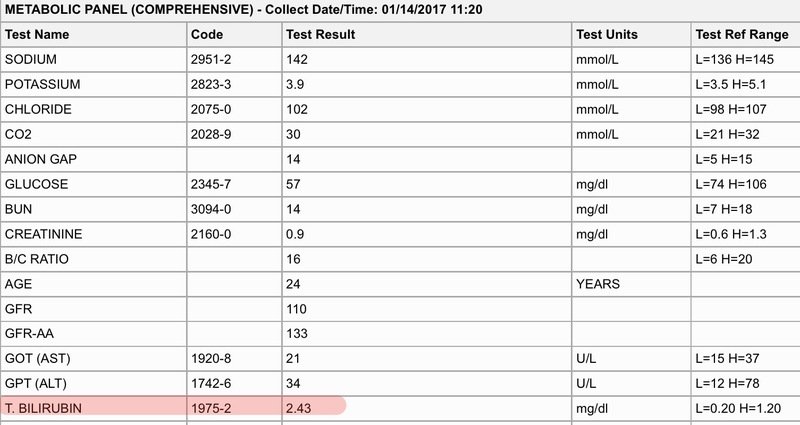 Most often the total level of bilirubin is less than 2 mg/dL, and the conjugated bilrubin level is normal. A complete blood count (CBC) and a liver function test may also be performed to rule out other diseases than can cause elevated bilirubin. The combination of normal blood and liver function tests and elevated bilirubin levels is an indicator of Gilbert's syndrome. Genetic testing is not needed. Gilbert’s syndrome is generally present at birth but goes unnoticed until the late teens or early twenties. Individuals with Gilbert’s Syndrome were found to have reduced risk for endothelial dysfunction. Elevated bilirubin levels were found to reduce the prevalence of vascular complications and atherosclerosis in individuals with Gilbert’s Syndrome. This occurs by reducing the development of atherosclerosis by inhibiting the molecule responsible for intracellular adhesion. Dysfunction of the coronary microvasculature is also reduced due to the elevated levels of serum bilirubin. Gilbert’s syndrome does not require any treatment. Mild jaundice may occur but does not require medical intervention. 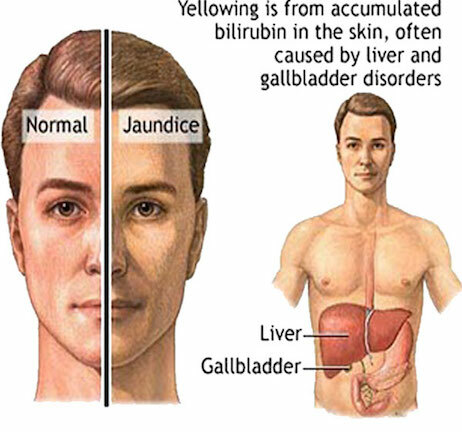 Jaundice caused from Gilbert’s Syndrome can be managed with rest, a healthy diet, and adequate fluids. Gilbert’s syndrome is considered a mild condition and life expectancy is not affected. No physical therapy management is required. The following are conditions that could present similiar to Gilbert's syndrome. Patient was a female who presented to the emergency room with severe vomiting, myalgia, headache and jaundice. Patient was 32 weeks pregnant upon arrival to the ER. Jaundice had been present for 3 days. Patient had similar complaints at 16 and 24 weeks of gestation. She had no similar signs or symptoms prior to her pregnancy. Treatment included IV fluids and the issues resolved. Patient was diagnosed with Gilbert’s Syndrome. The diagnosis was made due to constitutional symptoms present, hypoglycemia, and jaundice which was determined to be aggravated due to dehydration. The baby was born at 38 weeks following emergency Caesarian section. Both baby and mother were healthy at birth, five days and six weeks postnatal and showed no further signs of jaundice or elevated bilirubin levels. ↑ 2.0 2.1 2.2 Sertoğlu E, Tapan S, Doğru T, Acar R, Doğan T, Ince S, et al. Gilbert’s syndrome: protective effect on endothelial dysfunction. Turkish Journal of Biochemistry. 2016Dec;41(6):451-8. ↑ 4.0 4.1 4.2 4.3 4.4 4.5 4.6 4.7 Radoi VE, Ursu RI, Poenaru E, Arsene C, Bohiltea CL, Bohiltea R. Frequency of the UGT1A1*28 polymorphism in a Romanian cohort of Gilbert syndrome individuals. Journal of Gastrointestinal and Liver Diseases. 2017Mar;26(1):25–8.